Are you reading this from CHA? 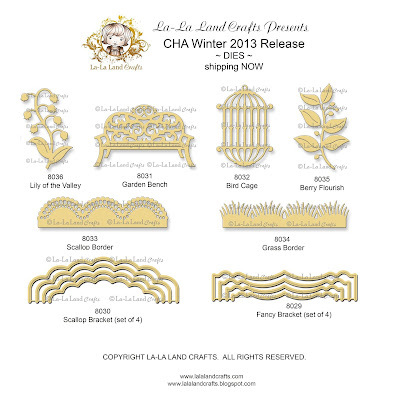 Have you been to the La-La Land Crafts booth yet (Booth 2473)? No??? What are you waiting for?? We have some AMAZING new STAMPS, DIES and a BRAND NEW PRODUCT for you to see!! For those of you not so lucky as to be at CHA, don't worry. We've got the NEW STUFF and some gorgeous samples from our fabulous design team right here for your visual delight. Now for our Design Team Showcase samples!! They are all AMAZING!! 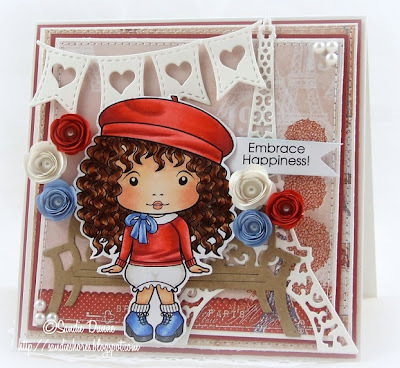 We hope you enjoyed all the fabulous creations made using our NEW CHA stamps and dies! Our Team went above and beyond to showcase these beauties, and we hope you visit their blogs to leave them some love. 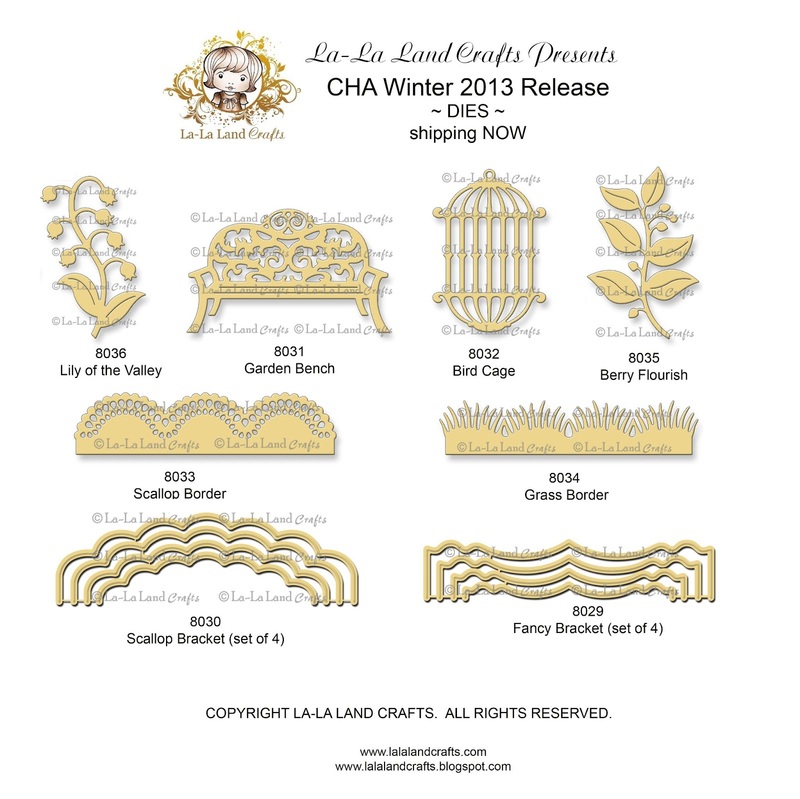 You can now ORDER the stamps and dies from CHA Winter 2013 Release! Have a great week and we'll see you back here Monday with our Inspiration post for the week. Gorgeous cards! I love the new release. I can't wait to get the digi's. 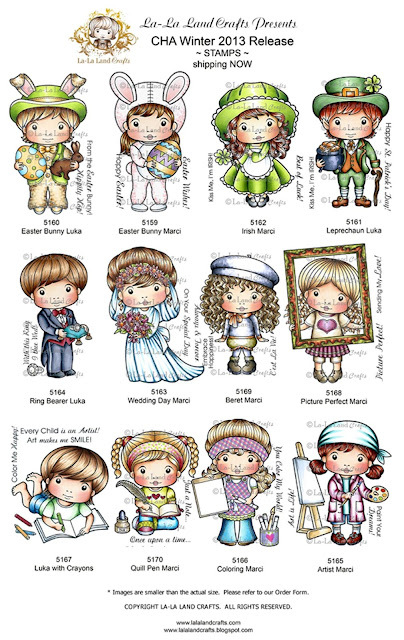 What awesome new stamps & dies! Such beautiful samples too! I want them all - LOL! Fun images, just darling! And fantastic inspiration from the design team. The images are all awesome! oh i already love the bride and betet marcy. Luka with crayon is so cute! thanks to the DT for sharing their beautiful works. So inspirational! Ohhhh I love them. Great job DT. GAHH! I love your stamps! I've been making Marci, fussy-cutting her and paper-piecing her together for cards and even a piece of wall art. I want them all and the dies that go with them, such great stuff! Thanks for the wonderful make-n-takes at CHA! Sandy is so patient and such a good teacher! I LOVE all your samples and the new products are awesome! WOW! The design teams cards are FANTASTIC!!! I just love the new images, they are so darn cute! Of these! To all the design team your cards look amazing... Love the new images can't wait to get them.